A couple of good articles on the problems of dust in the agricultural sector. “A beam of sunlight streams into your living room, illuminating a Milky Way of dust particles hanging in the air. Although the air looks thick, those visible dust particles are so big that they can’t reach the smallest branches of the respiratory tree in your lungs. It’s the dust we can’t see—smaller than 2.5 microns, called PM 2.5—that can cause allergies and other respiratory problems. “Perhaps more than any other occupational group, agricultural workers are exposed to a tremendous variety of environmental hazards that are potentially harmful to their health and well-being. Farmers and farm workers suffer from increased rates of respiratory diseases, noise-induced hearing loss, skin disorders, certain cancers, chemical toxicity, and heat-related illnesses. There are precautions that can be taken to minimize or eliminate these potential hazards. Organic Dust Toxic Syndrome (ODTS) is a common respiratory illness manifested by temporary influenza-like illness with fever, headache, and muscle aches and pains. 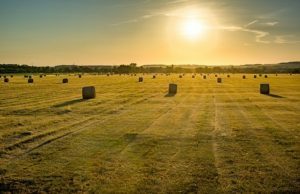 Although much less common than ODTS, Farmer’s Lung is an allergic reaction caused by inhaling dust from moldy hay, straw, and grain. Dairy and grain farmers are the most common victims. The months when moldy crops are handled indoors are the most dangerous. For those who are susceptible, repeated exposure damages lung tissue, ca sing shortness of breath and a growing inability to perform strenuous work. Victims eventually may find it a struggle even to get out of a chair. Dust from moldy hay, grain, and silage can also cause ODTS, which has symptoms resembling Farmer’s Lung. However, ODTS does not produce long-term illness or cause permanent lung damage. Agricultural noise is another common health hazard on the farm. It is estimated that 10 percent of U.S. farm workers are exposed to average daily noise levels above 85 decibels, which is the “action” level at which hearing conservation program are required for industrial workers. Studies at the Universities of Missouri, Wisconsin, Nebraska, and Iowa found that noise-induced hearing loss has been found to affect a quarter of younger farmers, and at least 50 percent of older farmers. Significant numbers develop a communication handicap by age 30. Please follow the link above to read the full article.